"We won't import ready products, software, or systems that can be designed, produced, and developed in our country, except for emergencies. We will definitely develop our own designs, products, and systems. Of course, we may collaborate with international defence industry companies wishing to work with us by accepting our terms. However, this collaboration will most certainly not include the purchase of ready products. On his talk shows, Mr. Adnan Oktar regularly reminds that Turkey should become a country with strong ammunition, producing its own defence systems. During a statement, “We won’t import weapons except for emergencies,” said President Tayyip Erdogan. ADNAN OKTAR: Let’s make Turkish army exceptionally powerful. Missile systems are very important. Roketsan develops our missile systems, but it’s kind of slow. They need to be faster. Let’s store more rockets. ADNAN OKTAR: The most important thing is to have missiles. Long-range, short-range missiles... From land to land, from land to air. Missiles from land to air are of importance. It’s very important for our army to have air defence missiles. In my opinion, the most important weapons are air defence missiles. In other words, the missiles that make planes and missiles stay away. These would be very intimidating. ADNAN OKTAR: It’s important for Turkey to put emphasis on rocket industry. We kindly ask Ministry of Defence [to take care of this.] We need to have tens of, hundreds of thousands of rockets. These rockets should have ranges that reach as far as a thousand, two thousand, three thousand, five thousand kilometres. We need to be as intimidating as Iran. ADNAN OKTAR: The missile technology, in particular, should be developed. For instance, they can build rockets with gyroscope control and with simpler technologies. It wouldn’t cost that much. The important thing is to have a lot. This would make PKK worry and would intimidate them. ADNAN OKTAR: Another thing is that the quality of weapons needs to be improved. Everyone in the special operations, maroon berets, and other soldiers should be given the most developed automatic weapons in the world. This would shake PKK. Having the best technology in the world is an obligation for us. For Muslims, having the best weapon technology is an absolute religious duty. The provisions of the Qur’an and God’s orders are clear. There’s no need to wait. But I don’t want a single drop of blood to be shed. Let’s use the intimidation of the weaponry. 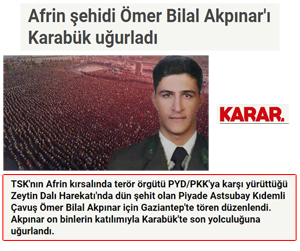 A funeral ceremony was held in Gaziantep for Senior Infantry Sergeant Omer Bilal Akpinar, martyred during the Operation Zeytin Dali (Olive Branch) in Afrin, conducted by Turkish Armed Forces against the terrorist organization PYD/PKK. Tens of thousands of people paid their final respects to Akpinar in Karabuk. A large crowd accompanied the martyr funeral of Senior Infantry Sergeant Omer Bilal, martyred during the Operation Zeytin Dali (Olive Branch) in Afrin, conducted by Turkish Armed Forces against the terrorist organization PYD/PKK. ADNAN OKTAR: It's a shame to have a martyr funeral with few people. It wouldn't look good for the image of that city or town. Look, after my warning, thanks to God, the funerals got more crowded. There should be at least three or five hundred people; this is how it should be, and this is the least we can do to show our love and respect for our martyrs. They use their young bodies as a shield against bullets just for God's sake. You're going to leave your house and attend the funeral, say Allah-u Akbar, worship; it will only take five minutes and you will be considered to have done a good deed just like daily praying You’re saying goodbye to a martyr. Every step you take is considered a good deed; you’re taking those steps for God’s sake. ADNAN OKTAR: They sacrifice their bodies and lives in the name of God for our nation, flag, and country, to protect our country and the integrity of our territories. Our brothers and sisters should make sure that they go to their funerals and that they have a very crowded funeral. Let's not say funeral but call it a farewell to our martyrs. 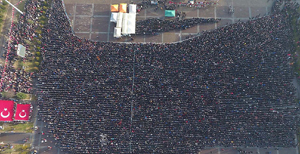 ADNAN OKTAR: Every martyr funeral should have at least two million people. This is it. You need to alarm everyone. ADNAN OKTAR: They put martyrs in coffins. And they cover the coffins with the flag. First, martyrs are not enshrouded. Our heroes should be put in the graveyards with their clothes covered in blood, in their own uniforms. And martyr funerals cannot be done with one hundred, two hundred or a thousand people. Every time, there should be at least a million people there. The state should organize this. The earth and the sky must shake. The earth and the sky should shake with the chants of ’Allah-u Akbar’s. If they take serious steps in arts and culture, Turkey will hold a more powerful position in the world and the perspective of the society, especially of the youth, in our country will also develop and broaden. To establish this, we are determined to move up education and culture among our priorities. We know that, otherwise, our future will be in danger. The father of our republic, Veteran Mustafa Kemal expressed this when he said: "A nation deprived of art has lost one of its life veins." In this manner, every investment made in arts and culture excites us and makes us happy." Publicly explaining in his years-long tv programmes that quality is one of the most important topics in life, Mr. Adnan Oktar has been insistently emphasizing for years that it is impossible for any country to go further when the quality, art, aesthetics, science and happiness of women are ignored; and he has been giving examples of Atatürk’s sense of art and quality. As a matter of fact, frequently mentioning the subject of quality after Mr. Oktar’s speeches on the issue, President Erdogan has recently stated that the power of nations is measured by the arts and culture they possess, quoting Ataturk. ADNAN OKTAR: If only they could be half the man this charismatic and saintly human. Look at how elegant, cheerful and classy he is. Let them see the epitome of handsomeness and bravery. Look at how noble, classy he is. Everything about him is elegant and classy. This is the ideal statesman persona. A statesman should be as stylish, classy, graceful, and exquisite as Atatürk. Atatürk is underappreciated. There should be a comprehensive program to reintroduce Atatürk. It would be better if TRT took initiative once more in this regard. The Presidency of Religious Affairs should have sermons in all mosques and have preachers give speeches, and TRT should broadcast non-stop to promote Atatürk. The younger generations should learn to recognize and appreciate him. ADNAN OKTAR: In Turkey, they want to separate the public into two That is, there is a segment of people known as Kemalists and intellectuals, who dance, laugh, play, listen to music, and value quality; and they love Atatürk. And then there is another segment of people, an introvert segment known as the Orthodox, the ones who despise Atatürk, the ones who also despise listening to music, who don't care much about their apparel, or art, painting, any form of entertainment, or a lively way of life. Now, what we do is applying the mortar to keep these two segments together. So, what are we doing? We say, “we are both religious, we are for the holy, we are for the spiritualism, we accept the Sunnah that aligns with Qur’an, and we also accept dance, entertainment, music, freedom and everything the youth likes.” And this is a very powerful combination. Atatürk cleared the dajjals and tyrants off. He annihilated polytheism. He reintroduced the Islam based on the Qur’an and as practiced by the Companions. Atatürk scattered away the dark clouds over the Ottoman Empire. He gave rise to the intellectual Turkey. He created the glorified Turkey. He was a person of love, quality, good manners, affection, friendship, brotherhood, classiness, science, art, aesthetics, and he was everything that is beautiful. ADNAN OKTAR: There should be a course to teach quality. Most of the children are unaware of the reason why they live. They don't know the purpose of life. They are in depression. Some of them commit suicide. They also don't know why they are studying. If you'd ask, they wouldn't know. They are trying to find out on their own. This is not the way. You should tell them. For instance, it is vital to learn about quality for a girl and fora boy, as well. About the ways to become a quality young boy, a quality young girl, how to have a quality face, quality hair, quality make-up, quality clothing, food, table... We can count thousands of these. These all should be taught. The most vital subject of the life is quality. The most beautiful characteristic of the heaven is its quality. Because of its quality, the heaven is beautiful. ADNAN OKTAR: First and foremost, the way public views quality must be changed to set the ground for quality. A person’s having high quality on his own wouldn’t change a thing. His having quality will isolate him. Quality should be widespread, and for quality to be widespread, people need to know God’s sense of quality. They need to know God’s sense of artistry. And for this to happen, Islam of the Qur'an needs to be told both in Turkey and all over the world, it needs to be told everywhere. ADNAN OKTAR: Building roads, bridges, and dams lacks something without art and freedom. There should be art on every street and we should have freedom for women. Establishing a Ministry of Arts and Quality is a very important topic. This shows the importance Turkey place on the subject. If one step is taken towards it, more will follow. ADNAN OKTAR: When the word Muslim is pronounced, they want people to imagine a profile of uncared and dirty people with no taste However, being a Muslim means kindness, quality, beauty, art, science, good manners, nice words and in short everything that is beautiful. Life would have no meaning and beauty without art, quality, and aesthetics. We cannot bring up a generation that takes pleasure from art without educating them. The Ministry of Art and Quality should immediately be established for art and quality to dominate all walks of life from construction to shoemaking. Let this be the basic politics. ADNAN OKTAR: The government should be modernized with a greater quality and art should flourish. Freedom of women, prioritising women, art and quality… Any country that lacks these suffers from coups. Look around the world and you’ll see coups happening in every single one of these countries. ADNAN OKTAR: Turkey deserves a European style sense of art, quality, and democracy. There may already be a Ministry of Arts and Culture, but there may be a Ministry of Arts, Culture, and Aesthetics or maybe a subsidiary of Ministry of Arts and Culture. There may be a Ministry of Culture and Quality. There is an advantage in establishing a ministry that will combine art, quality, and all. “Even on this holiday, despite everything, women fulfill their work and do everything on time. We often think how you accomplish to do all of these. But most importantly we love you and we value you. We find everything we look for in women, both inspiration and solace. You fill this world with your beauty and your energy of life. We will do everything to ensure that women we love are surrounded with care and laugh more often." Mr. Adnan Oktar repeatedly explains in his discourses that countries where women do not laugh and where they are not free are destined to be ruined. Mr. Oktar also states that women are joy of the world and they should be respected and that they should be shown privilege everywhere. Russian President Putin also spoke at an International Women’s Day event and said, “You fill this world with your beauty. We will do everything to ensure that women laugh more often”. ADNAN OKTAR: Women are breath-taking beings. One cannot have enough of loving and looking at them. I’m surprised that people do not appreciate women. ADNAN OKTAR: It is important to protect women’s rights; they should be free. If half of the servants of God suffer, God does not give abundance. ADNAN OKTAR: A country where women are oppressed will not be fertile. Women should be free everywhere, they should be respected whether they wear a hijab or modern clothes. In the parliament and everywhere else, women should be privileged. Freedom of women is an evidence of high quality. Women’s beauty brings life to the entire world. The oppression of women brings the joy of the world to an end. Where there is no woman’s beauty, there is only a grave life. ADNAN OKTAR: Societies where women cannot be free, cannot laugh, cannot go out, and cannot be cheerful collapse. God will not allow the persecution of His servants. Women have to laugh and have fun as they like. It is not right to allow men to have fun while forbid women to feel joy. Guided by their conscience, women know righteousness. ADNAN OKTAR: Every society where women are oppressed collapses. Women should be free and independent. It is not conscientious to grant only men all kinds of freedom. It is disaster for people not to appreciate the value of women. It is a problem not to realize that women are such a blessing. ADNAN OKTAR: When women are oppressed, God gives trouble, which brings inauspiciousness. God created women for love. When they don’t have love for women, they spread hatred for women and try to forbid women from laughing and feeling joy. ADNAN OKTAR: Women must be given privilege in every issue. Women should be protected and they must be privileged in every field. Mr. Adnan Oktar has been saying in his discourses for many years that the bigoted mindset produces unlawful deeds [harams] which are not prescribed by the Qur’an and thus renders the religion of Islam inapplicable. Especially in recent interviews, Mr. Oktar has explained that Islam is very easy to practice by giving examples from the verses of the Qur’an. He also states that the bigoted rationale forbids laughter, having fun, listening to music, women wearing shorts, men cutting their beards, youngsters having tattoos and thus distances people from religion. 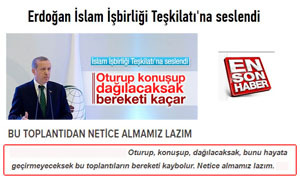 Following these statements of Mr. Adnan Oktar, Mehmet Görmez, the Head of the Directorate of Religious Affairs, made a speech for the first time about the fallacy of this bigoted mentality. He said people should not meddle in young people’s way of dressing, beards, tattoos, earrings and the religion should not be made difficult by introducing supposed unlawful deeds which are not prescribed by the Qur’an. ADNAN OKTAR: The bigoted mentality makes life miserable. The religion they describe has nothing to do with true Islam but it causes many people to be against Islam. ADNAN OKTAR: What is peculiar to bigotry is to despise God’s religion and –may God forbid- to teach religion to God. Islam is the religion revealed in the Qur’an. In the bigoted system, everybody introduces some new provision. We trust the word of God, not the mentality of these people. They prevent millions of people from living by Islam as they make up provisions that are not commanded by the Qur’an. This is a huge wrongdoing. ADNAN OKTAR: Every aspect of the conception of religion which is not based on the Qur'an is disastrous. According to this conception of religion, laughing, dancing, painting, sculpture, music, women’s going out, children’s wearing shorts are all forbidden. The penalty for shaving beards or not performing prayers is death: None of these prohibitions exist in the Qur’an. A religion which is not commanded by the Qur’an turns the world into hell. ADNAN OKTAR: Bigots present a life in which a father cannot be affectionate towards his daughter or a mother cannot freely walk around her son as a religion. This is horrible: This is a religion of ascribing partners to God. They say, “Taking photographs, hanging paintings, listening to music, dancing and laughing,I do all of these things, but I also know that they are unlawful.” The fact is, none of this is unlawful, they are all lawful. A Muslim fears God and is meticulous about unlawful deeds; he does not commit anything unlawful. This being the case, people of this mindset want to take away all the lawful blessings of Muslims. Music, dance, art, quality, science, beauty and fun are not unlawful. Moreover, it is great dishonesty to engage in a deed which one believes something to be unlawful and then counseling Muslims. ADNAN OKTAR: Religion is easy; this is how God prescribes the religion to be. God says in the Qur’an, “He has selected you and not placed any constraint upon you in the religion – the religion of your forefather Abraham” (Surat Al-Hajj, 78). Making the religion difficult is a scheme of satan. ADNAN OKTAR: They introduce religion as if it is against human nature -may God forbid- as if it is complicated and frightening. We’ve clearly explained that religion is compatible with wisdom, rationality and human nature. We have shown the beauty of religion with the life that we live. We have shown the religion based on reason and rationality gives no room to superstition. By living by it, we have shown people that our religion is easy to live by and love is prevelant in it. ADNAN OKTAR: There is no difficulty in Islam. God wants it to be easy; this is emphasized many times in the Qur’an. He says He has “not placed any constraint upon you in the religion – the religion of your forefather Abraham.” In another verse God says, “God does not desire difficulty for you” (Surat al-Baqara, 185). Islam is like a feast, it is the religion of joy. There is no beating of people, or making the life of women miserable in Islam. Women are treated like flowers in Islam. ADNAN OKTAR: Religion is a system that gathers together all the beauties of the world. There is happiness, joy, fun and music in the religion. Women freely go out, wear modern clothes if they want, or wear a hijab if they want, nobody can interfere. They can laugh, have tattoos or wear a wig if they so choose. Religion will not interfere in such things. Religion wants us to be conscientious, honest, wise, and meticulous about what is lawful and unlawful. Religion is the other name for joy. ]]>http://sheikhnazimalhaqqani.com/en/What-he-said-What-happened/261332/president-of-religious-affairs-dohttp://sheikhnazimalhaqqani.com/en/What-he-said-What-happened/261332/president-of-religious-affairs-doFri, 27 Oct 2017 12:52:38 +0300Armenia: "We may return some of the territories to Azerbaijan"
Making a surprising statement in the Sixth Armenian Diaspora Forum meetings held in Yerevan, the Armenian Minister of Foreign Affairs, Eduard Nalbandian, said, "In order to hasten the ongoing negotiations within the scope of the OSCE (the Organization for Security and Co-operation in Europe) that aims to settle the Karabakh dispute, we, as the Armenian side, may return certain Azerbaijani territories that does not pose a threat to the security of Karabakh. Negotiations with Azerbaijan on this issue continue. I cannot share any further details about this step that we will take to reduce the tensions between our countries." One of the topics Mr. Adnan Oktar frequently touches on in his programs and articles for years is the unification of Armenia, Azerbaijan and Turkey within the framework of the Turkish-Islamic Union. Mr. Oktar has just recently readdressed this issue, saying, "We will unite Armenia and Azerbaijan, and return the Azerbaijani territories that were taken from Azerbaijan." 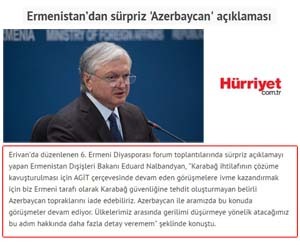 Soon after Mr.Oktar's statements, Armenian Minister of Foreign Affairs Nalbandian stated that Armenia could return territories that, in terms of security, will not ‘threaten neither Karabakh, nor the settlement of the conflict’. ADNAN OKTAR: I cannot wrap my head around why Iran, Turkey, Russia, Azerbaijan and Armenia do not unite? Where is the harm in that? The tension between our countries is pointless, for nothing. Why should we stand alone? What will this prove? Why should there be a passport or visa requirement? First of all, Russians are a humble, good-natured people. Iranians are saintly and pious people. Azerbaijanis are a noble and dignified people, among the most wonderful examples of the Turkic race. Armenia is a downtrodden country; we consider the Armenian people as our own children. ALL THE TERRITORY TAKEN FROM AZERBAIJAN WILL DEFINITELY BE RETURNED, IF GOD ALLOWS. It was a scheme of the British deep state after all, a scheme to severe our relations, to burn all the bridges between Armenia and Turkey. We will talk it over and settle the dispute amicably. ADNAN OKTAR: Azerbaijan is our beloved, our heart, our soul. We love Azerbaijan dearly. We find the Azerbaijani state and its government successful. May God grant them success and help them. THE AZERBAIJANI TERRITORIES WERE CEDED TO ARMENIA, BUT THEY WILL SURELY BE RETURNED. WHAT WAS ENTRUSTED WILL SURELY COME BACK. Besides, Armenia did not establish any settlements on these lands. That means they know that they will return those territories. There is no need for our brothers to worry in that regard. And we will catch the culprits through law and legislation; I swear upon God that we will have them stand trial before the law. But it would not be befitting of any Azerbaijanis to look upon our other innocent Armenian brothers and sisters with animosity. We should love the innocent Armenians, treat them with mercy and compassion, and embrace them as our brothers and sisters. And I swear upon God that we will have all the ceded territories returned to Azerbaijan. This will certainly come to pass. There is no other solution. Besides, Armenians were already willing to do so. Everything was going smoothly. Turkey was acting as the mediator. But the entire process was thwarted. We devoted considerable effort to reach that stage. But all the efforts we made for years were frustrated by the intervening tricksters. ADNAN OKTAR: The word Azerbaijan ends with 'jan' [Meaning 'Dear' in Turkish]. This signifies the fact that they are a dear people, that they are pure and saintly people. May God bestow vigor and strength upon them, May He grant them health and wellbeing. We do not want them to have a falling out with the Armenians. WE WILL UNITE ARMENIA AND AZERBAIJAN. WE WILL RETURN THE TERRITORIES TAKEN FROM AZERBAIJAN... I embrace my Armenian brothers and sisters in Armenia with love and respect. I love them all. Armenians are our friends and siblings. Why? Because during the Ottoman era, we appointed many pashas from among them. We trusted our army with Armenian pashas and called them 'the loyal nation'. We will return to the old days. Azerbaijan, Armenia and Turkey will unite, and draw a beautiful, happy picture. WE WILL RETURN ALL THE LOST TERRITORIES TO AZERBAIJAN, THUS BRINGING AN END TO THIS DARK PERIOD. This policy of hatred cannot be pursued forever. Because, I consider the saintly people of Armenia who did not partake in the murders as my brothers and sisters. Blaming them for crimes they did not commit would be very cruel. The British are behind the Qatar Crisis: The British are re-drawing the maps. The British are the ones making the plans which seek to destroy Islamic organizations and play Muslims off against one another. 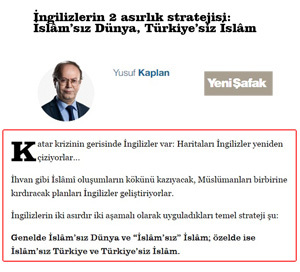 In general, a world without Islam and Islam without “Islam;” and specifically, Turkey without Islam and Islam without Turkey. Indicating that the British deep state tries to oppress Islamic states one by one through isolation policy, Mr. Adnan Oktar states that the British deep state now tries to gain control of Qatar. Mr. Oktar reminds us that no Islamic state should fall for this plot and that the Islamic countries should unite. 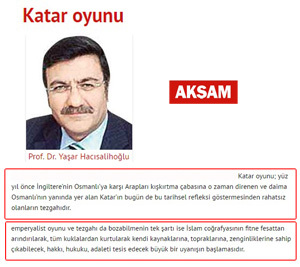 Yeni Şafak columnist Yusuf Kaplan, and Akşam Newspaper columnist Prof. Dr. Yasar Hacısalihoğlu, wrote articles on the plots of the British deep state on Qatar. ADNAN OKTAR: We should stay united with Qatar; in the mean time Saudi Arabia is our dear brother as well. Saudi Arabia is a significant and important Islamic country, with a great and beautiful Muslim community. We support Saudi Arabia with all our strength. We support United Arab Emirates as well. We are just warning our brothers of the sinister plot. Spies of the British deep state went there. Everybody knows that the deep state supports these people. The utmost caution should be exercised. They intend to crush the Islamic states one by one. First they claimed that Iraq had “atomic bombs,” and then they invaded and destroyed the country. They siphoned off its national treasure, and messed it up. Same applies to Libya; they claimed that there was terror there and destroyed it. They mess up the countries one-by-one. They said “Afghanistan is a state sponsor of terror, they brought the twin towers down” and they ruined it. Now, Qatar is a rich country, and they intend to ruin it as well. After that, they have plans for Saudi Arabia. They make Saudi Arabia do this to Qatar, but it would be its turn later on. Turkey’s the last target for them. They are afraid of Turkey since it is strong. The real target in fact is Turkey, but they cannot come at us right away. They tried to do something with FETO, but they couldn’t manage. The whole world now realizes that because Islamic Unity is not established and Hz. Mahdi (as) has not appeared yet bring destruction to the region. ADNAN OKTAR: The British deep state is plotting nefariously. This calls for an immediate intellectual intervention. The deep state wants to divide Muslims into two. They are cooking up a major plot. They want to create a Rumi side; and they also want to make devout Sunnis and Shiites clash against each other. They are thoroughly prepared, and they have a lot of people capable for the job. The government should be extremely cautious on this matter. The Qatar crisis should immediately be resolved. Turkey should thwart this game. Saudi Arabia, too, should see through it. Turkey and Qatar have good and strong relations. Qatar has significant investments in Turkey, as does Turkey in Qatar. There is magnificent economic connection between us. This bothers the British deep state. They would like to “disconnect” us, and bring down Qatar, and take it under their control. Had there been Islamic Union and the Mahdi movement, they would not have been able to do it. Since every country is on its own, they can bring them down with ease. Saudi Arabia should be extremely careful and not fall into this trap. Mr. Adnan Oktar, who frequently mentions the importance of quality at home, at work, on the street, in dressing style, in education; in short, in all aspects of life, emphasizes that countries with deficiencies in art and quality become vulnerable to coup attempts. President Erdoğan also made a speech about importance of quality and said “We must remember that societies despising culture and art are doomed to fail”. ADNAN OKTAR: Constructing roads, bridges and dams remain insufficient without the existence of art and freedom. There must be art in the streets and there must be freedom for women. It is crucial to establish Ministry of Arts and Quality. This would show the importance Turkey gives to the matter. As the initial step is taken, further steps will follow. ADNAN OKTAR: Some think Muslims are poorly groomed, unclean people with no sense of taste. However, Islam is graciousness, quality, beauty, art, science, good manners, kind words, and elegance, in short, everything that is beautiful. Life has no meaning without art, quality and aesthetics. Without education, a generation with the sense of art will not be raised. As soon as possible, Ministry of Art and Quality should be established, thus art and quality will prevail everywhere from construction to shoe manufacturing. This should be the basic policy. ADNAN OKTAR: One of the most vital issues for Turkey is quality and art. It is certainly necessary to establish Ministry of Quality and Art and make progress in this field. It is the requirement of the Qur’anic morality for Muslims to be of good quality, decent, well-mannered, tasteful, neat and clean. Presenting an awful state as religion is a terrible wrongdoing. ADNAN OKTAR: It is a spiritual disaster that the number of people who lack quality and sufficient knowledge, and who talk to each other with clichés increases. People can own a spirit of high quality by reading more and improving themselves. Turkey must make a progress in the field of quality. ADNAN OKTAR: In order for the party in power to be strong, it must make art, quality and love a philosophy of life and have many intellectuals. The opposite would damage the country in the long run. In some countries, the governments only give priority to economic development whereas the essence of life is love, art and quality. When notion of quality develops, coup and uprising becomes impossible. ADNAN OKTAR: Turkey will be very strong when she focuses on being modern, seeks quality and gives particular importance to art and aesthetics. Coups are not possible in countries where art, freedom, quality and women’s rights exist and women live freely. Now there are many art works in many places but these works are coarse. Art cannot be coarse, it should be elegant. Graceful beauty is not taken into consideration. For example, we look at earlier art works and we see elegance everywhere. Then a period of gross and unsophisticated art began in the 2000s. 2021 and later on will be the years of perfect art. We will not see this grossness in those years. We witnessed grossness in 2000s. Everything will be elegant, buildings will be elegant, gardens will be elegant. For example one builds a garden but it looks so crude, he plants pine trees from side to side, all in the same height, this is not the way to do it. Another one builds a building which is so unrefined and soulless. We look at people; their clothes just serve the function lacking any aesthetics or beauty. These people are not concerned with beauty, but only functionality. It should not be this way. During the fast-breaking meal in Kilis, President Erdoğan spoke about giving citizenship to Syrian refugees. Mr. Adnan Oktar stated in his discourse that it is necessary to give Turkish citizenship to the Syrian refugees. Mr. Oktar said that those Syrian brothers who want to be Turkish citizens must be granted this right. Mr. Erdoğan also gave the good news in an iftar dinner and said that they will help the Syrian refugees to become Turkish Republic’s citizens. ADNAN OKTAR: Mr. Erdoğan should give them identity cards. They should be Turkish citizens. He consistently asks people to get married and start a family.” But we already have 3 million people [the Syrian refugees in Turkey]. There is no need to keep them waiting. They are all people with holy light; they are very hardworking, decent, and they are well-behaved. We had 3 million people. He should not let them go back to their countries and ask them to stay in Turkey. They can settle in any place they want in Turkey. Mr. Erdoğan should grant citizenship to all our refugee brothers. He should give identity cards to all of them. I am waiting. For God’s sake, he should start this process immediately. ADNAN OKTAR: I think Syria border entry points should be opened. This is a critical issue that all parties must support. We should write a letter to our Prime Minister and ask for it. The other day, those kids got stuck on the border; they were not let in. Borders should be opened; they should come in. They should come not temporarily, but permanently. ]]>http://sheikhnazimalhaqqani.com/en/What-he-said-What-happened/230994/president-erdogan-“we-will-granthttp://sheikhnazimalhaqqani.com/en/What-he-said-What-happened/230994/president-erdogan-“we-will-grantFri, 30 Sep 2016 00:03:32 +0300Tayyip Erdoğan: "We will focus on the contents of the education of youth"
"We have seen that laying the ground work is not enough. In this field, serious studies and effort have to be made regarding the contents of the conscience and the education that will be provided to new generations. Stating for many years that Darwinism is a philosophy outright denying God, Esteemed Adnan Oktar says that the fallacies of the theory of evolution, as well as the information about creation should be included in the curriculum. Mr. Oktar also gives voice over and over again to the need for raising a generation with a national conscience. Likewise, referring to the changes to be made in the Turkish curriculum, the President, Mr. Erdogan has recently stated "We have seen that laying the ground work is not enough." ADNAN OKTAR: A national conscience class should be introduced in schools. When Darwinism and materialism are eliminated, so will be the source of new members for the PKK. Because, eliminating these philosophies means eliminating the ideology that drives the PKK. This way, there will be no more suicide bombers. Why would a person accept to be a suicide bomber when he is full of love and fear towards God? Why would such a person become a Darwinist, a materialist? Turkish state supports Darwinism. The Ministry of National Education is ceaselessly teaching Darwinism to the youth. ADNAN OKTAR: If we want level-headed, profound people who abide by the Quran and its tenets, we should abandon the Darwinist education system. Turkey should abolish the Darwinist education system. This would be a major blow to the irreligious and the system of antichrist; it would make a huge impact. It would be wonderful to explain Darwinism in greater detail and offer a response against it. ADNAN OKTAR: If we do not want our ties with our national identity to be severed, the first thing we should do is to put an end to the Darwinist education system. Darwinist, materialist education system poses the direst of threats. Because, the Darwinist philosophy denies God, the Prophets, the revelations, in other words, Darwinism is a system that denies everything we consider sacred. The state is promoting Darwinism by publishing and distributing millions of books to elementary, middle and high schools, as well as universities. Teacher Tayyip should specifically address this gravest issue. ADNAN OKTAR: Training a person to be a technical worker and training a person to be religious, to be a Muslim is two very different things. When people trained to be Muslims, to be men of cause, these believers band together in the face of a crisis; however, when people are trained to be technical workers, they do not care about anything other than their occupations. They never put themselves at risk, or wish to go through difficulties for others. They only seek personal interest. Of course, I do not refer to all of them; some of them might act differently but most of them are like this. In conclusion, if personal gains, interests are prioritized in the world, people will only seek self-interest; but, if a world that is befitting of God's approval is desired, then, a pious youth should be raised through the truths of faith and miracles of the Quran. ]]>http://sheikhnazimalhaqqani.com/en/What-he-said-What-happened/224649/tayyip-erdogan-we-will-focushttp://sheikhnazimalhaqqani.com/en/What-he-said-What-happened/224649/tayyip-erdogan-we-will-focusSun, 03 Jul 2016 00:21:32 +0300Tayyip Erdogan: "If we are going to just sit, talk and disperse here, this meeting has no meaning. " "If we are going to just sit, talk and disperse here and do not put what we have discussed into practice, this meeting has no meaning. Esteemed Adnan Oktar frequently states that as certain Islamic scholars do not possess the awareness and the enthusiasm for Turkish-Islamic Unity, the meetings held to discuss the solutions for the problems of the Middle East fall short of their goals and are nothing but unresolved talks. In his speech in the Islamic Cooperation Meeting, the President Mr. Tayyip Erdoğan also drew attention to this issue. ADNAN OKTAR: Institutions and organizations can do nothing in this regard. If they could, they would have already done so. They hold frequent meetings, in which they just drink tea, eat cookies, have a chat and disperse. They have been holding meetings, sharing their knowledge, and displaying their wisdom for years now. Yet, nothing comes out of these meetings. Everyone turns back to their daily struggles. What they need is love, passion; love towards God, love towards Hazrat Mahdi (as). Without these, all their deeds are in vain. Nothing can be achieved through cold, formal rhetoric. What they need is passionate love; towards your nation, towards the Muslims, and above all, towards God and His Messenger (saas). Once that passionate love takes over people's hearts, the warmth of that love will spread throughout the world. This is it. Otherwise, frigid souls will get them nowhere. ADNAN OKTAR: Such big causes call for a temerarious determination, a temerarious resolution. They call for a sheer persistence. They require not weariness, but cascading enthusiasm and tremendous excitement. Without enthusiasm, there can be no unity. Union of Muslims Scholars holds meetings every year. Together, they eat dinner, have a chat at the hotel and disperse. Year after year, they do the same. This is because most of them lack the excitement and enthusiasm. The historical Grand Synagogue of Edirne restored by the Directorate General of Foundations was opened for worship, hosting the first wedding ceremony in 41 years. Edirne Deputy Governer Tekinarslan and Mayor Recep Gürkan, as well as Turkish Jewish Society head İshak İbrahimzadeh, the couple's relatives and approximately 3000 guests attended the ceremony. Beadsmen Nesim and Viktor Beruhiyel from the Jewish Society administered the wedding ceremony. 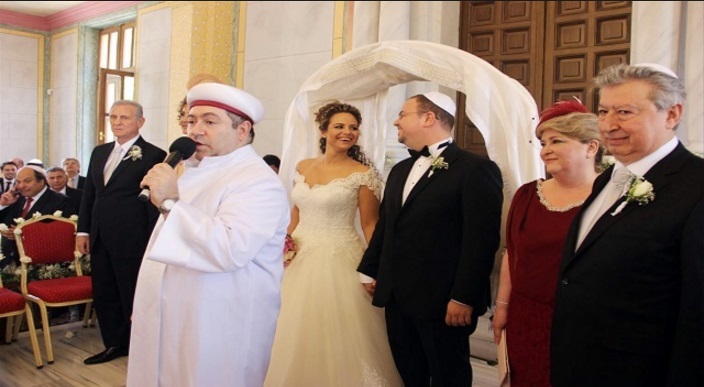 The wedding was held according to the Jewish traditions, and during the couple’s religious marriage ceremony, prayers were said for the Turkish Republic and Recep Tayyip Erdoğan. 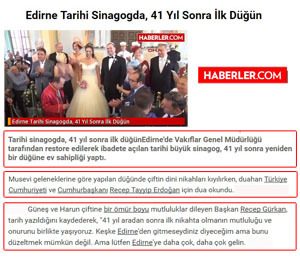 The official marriage ceremony was performed by the mayor of Edirne following the prayers and a religious wedding. For many years, Esteemed Adnan Oktar has been stating in his programs that the People of the Book should be treated with compassion, and saying that the Turkish government should carry out an inclusive policy towards the Jews and the Christians, as well as protect the synagogues and churches in our country. Following, our government has taken many steps to mend the relations between Turkey and Israel. The last example of this was the reopening of the historical Grand Synagogue of Edirne for worship after being restored by the Directorate General of Foundations which hosted a wedding ceremony for the first time in 41 years. ADNAN OKTAR: The Christians in Turkey should be supported. It is truly grave and horrible for the churches in Turkey to be closed down. We should invite the Christian priests here and hold a meeting against the closing of the churches. One by one, the churches are being closed down and turned into pubs. This is horrible; we cannot sit in silence and watch it happen. ADNAN OKTAR: This is really terrible. The Christians and the Jews are the ornaments, the beauty of the Middle East, of Turkey. This is a horrible outcome; we should correct this as soon as possible. Let the Christians, the Jews return to their homelands. Let them return to Egypt, to Jordan, to Iraq; this mistake must be put right as soon as possible. This is a terrible disgrace. ADNAN OKTAR: An immense anti-Semitism has taken hold around the world. Anti-Semitism has currently reached as high as 90% around the world. There is a huge anti-Semitism all around the world. We are trying to eliminate it. We are trying to eliminate the anti-Semitism in Turkey. We are trying to eliminate the anti-Semitism all around the world. ADNAN OKTAR: Let people build synagogues, churches, mosques if they wish so. The Quran does not preach hatred towards churches or synagogues. On the contrary, Almighty God commands Muslims to preserve churches and synagogues. Despite this, some people attempt to burn them down, vandalize them. This is unacceptable. ]]>http://sheikhnazimalhaqqani.com/en/What-he-said-What-happened/224647/first-jewish-wedding-at-historicalhttp://sheikhnazimalhaqqani.com/en/What-he-said-What-happened/224647/first-jewish-wedding-at-historicalSun, 03 Jul 2016 00:12:52 +0300The President Erdogan: "You will not separate us"
"They are envious of our brotherhood and they want to tear it down. Now, to those who want to separate us, we should send this message with a strong voice "You will not separate us". Frequently mentioning in his talk shows, articles and books that Turkey cannot be separated, Esteemed Adnan Oktar says that, especially our politicians should make statements on this particular subject as well. 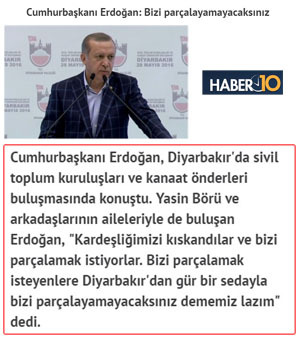 The President Erdogan being in the first place, many politicians have made statements on this subject. 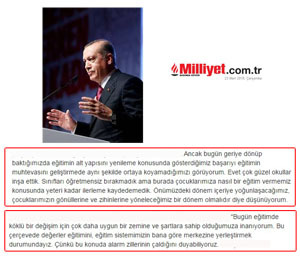 Lastly, in his public speech in Diyarbakır, Mr. Erdogan stated "They are envious of our brotherhood. To those who want to separate us, we should say 'You will not separate us'." ADNAN OKTAR: We are a modern, high quality nation of the Middle East. Those who attempt to destroy us, attempt to destroy the world as well as themselves. In short, we will never allow them to separate Turkey. ADNAN OKTAR: Let me say this; we will give no respite to the PKK in Turkey, the only place they deserve to be is jail. We will never allow them, we will never let them separate Turkey. ADNAN OKTAR: This decision is ours, the Turkish nation's to make. And we will never allow Turkey be separated. The army and the police are also expressing their opinion in this issue comprehensively. ADNAN OKTAR: And regarding the PKK, those fools would never have enough of their foolishness! An agreement with them is out of the question. We will never let them separate Turkey. What would separation of Turkey implies? It would spell the doom of the Islamic community, Turkic community. We will oppose this with all our strengths, we will never allow it. We will do what is necessary through law and legislation. Launching a campaign named "The Reading Nation”, the Dubai Sheikh Maktoum decided to distribute 5 million books to children in the month of Ramadan. In his conversations, Esteemed Adnan Oktar frequently states that the struggle against terrorism and the materialist philosophies should be carried out through methods of knowledge such as distributing books and getting across the miracles of the Quran, the truths of faith and the tenets of Islam. He also addresses this issue in many of his articles that are published in the newspapers abroad. One of these newspapers is Gulf Today. Similarly, the Dubai Sheikh Maktoum launched a campaign named "The Reading Nation" and distributed 5 million books to children in the month of Ramadan. ADNAN OKTAR: It should not be forgotten that having most of the Islamic world under its influence, the ideology of bigotry poses the greatest obstacle for prosperity, progress and welfare to blossom, and of course, it gives rise to the most ruthless radicalism. If sincere and rational Muslims want to develop a solution to the issue of radicalism, they must absolutely realize the danger it poses and tackle it through knowledge and wisdom. ADNAN OKTAR: The best way to struggle against terrorism is to distribute books, tell people of the truths of faith, the miracles of Quran, talk about brotherhood, love, and peace. ADNAN OKTAR: It cannot be achieved through violent methods; only through love, through wisdom. The best course to follow is to reason with them through love, wisdom, peace and science. Resorting to compulsion is not right. What you can do is to communicate with them; those who are sincerely on your side will join you. This is a wonderful blessing of democracy. This method is practiced by neither the bigoted mentality, nor the Orthodox-traditionalist Islamic conception, or communist, Marxist-Leninist system. The right thing to do is to invite people to peace and brotherhood. The entire Mideast could become a paradise if desired so. ADNAN OKTAR: Muslims should be pure, sincere, high-class and advocate the Quran; they should tackle against superstitions and bigotry; they should personally practice love compassion, mercy; they should get across the truths and miracles of the Quran, the truths of faith. ADNAN OKTAR: We should open up the borders, and let them enter the country. They should settle in not temporarily but permanently. We should build prefabricated houses for them. Then, they can gradually pay for the houses. For instance, let them pay a small fee every month. Everyone should recruit them. THEY CAN ALSO BE EMPLOYED IN AGRICULTURE WORK. They are sturdy people. They can green and embellish there. I think that it is an issue of critical importance. In this way, they can also get themselves free from the oppression. Let them come to and settle in the province of Hatay. The Housing Development Administration of Turkey should build houses for them. We are willing to pay their taxes. Supposing that they construct 200,000 houses for 100,000 households, 100,000 houses would be sufficient even for 200,000 people. What could be done to facilitate the integration of Syrian refugees? ADNAN OKTAR: The number of vocational courses and technical courses should be increased. Of course, for Syrians who already have a profession and a work permit, employment opportunities should be offered. In this regard, new employment opportunities might be created with the investments that the U.S., the EU and Arabic countries might make. In this way, Syrian refugees will be able to stand on their own feet without being in need. Along with these, JOB OPPORTUNITIES PRIMARILY IN FIELDS SUCH AS FARMING, ANIMAL HUSBANDRY AND AGRICULTURE SHOULD RAPIDLY BE PROVIDED FOR THEM. Mr. Adnan Oktar stated that the State should control everywhere and do the necessary with respect to the members of the PKK by expanding the relevant law, and told that if necessary, the state should revoke the citizenship of the members of the PKK. Indeed, Turkish President Mr. Tayyip Erdogan mentioned the concept of “deprivation of citizenship” for those engaged in terrorism for the first time. ADNAN OKTAR: The PKK members pretend to be students and chant slogans at universities. They act collectively. They should all be dismissed from universities. Their right to education should be revoked and this will be the end of the issue. This must be the method that should be employed. If necessary, they should be expatriated. A new law should be passed. This problem should be solved immediately. ADNAN OKTAR: There are some countries such as France, England, Belgium, the Netherlands and Canada which expatriate anyone carrying out terrorist acts. Turkey must also act like these countries. Anyone who is involved in terrorism should be expatriated. ADNAN OKTAR: The members of the PKK perform a folk dance at universities. They say, “Our army carries out their activities on the mountains while we do the same here.” That is why the state should follow a serious policy there; they should give no respite. Once a member of the PKK is identified to be at a university, he should be expelled. For example, how many people are there who act together with the PKK members? Let’s say there are one hundred of them; first off, all of them should be expelled from that university. At the second phase, they should be expatriated and deported. ADNAN OKTAR: France is now preparing to facilitate the expatriation of terrorists. Those involved in the acts of the PKK should be expatriated outright. ADNAN OKTAR: We want that the state should control everywhere in no time. We should carry out large-scale arrests, which is the way to fight against the PKK. They should expand the law. Being a member of the PKK should be considered as a serious offense. “When we look back today, I can see that we have not been as successful in improving the contents of education as we have been in enhancing the infrastructure of education. I believe that we should turn towards the hearts and minds of the youth. During his conversations, Mr. Adnan Oktar emphasizes that particularly the youth are not informed about Marxist, Leninist and Darwinist philosophies. He further stresses that it is necessary to put an end to the one-sided Darwinist education at schools and to explain the love of God, the miracles of the Qur’an and the signs leading to faith. Also, he states that the courses that enhance national consciousness should be included in the curricula. Indeed, our President delivered a speech admitting that Turkey has fallen behind in education and stated that a radical change will be made. ADNAN OKTAR: The majority of the youth are not equipped or informed enough to counter Marxist, Leninist, Stalinist and Darwinist philosophies. The elimination of the education based on Darwinism in Turkey would deliver a major blow to the PKK. A course teaching national consciousness should be included in the curriculum as a matter of urgency. The youth should be taught about the falsehood of Marxist and Leninist philosophies. Time is ticking away. ADNAN OKTAR: People with a strong personality who think deeply and act in compliance with the Qur’an and the mindset of the Qur’an should be raised. Then, we will put an end to Darwinist education. Turkey should discontinue Darwinist education. That would be the greatest blow to unbelief and the system of the antichrist. Explaining Darwinism more comprehensively and then responding to it would be great. ADNAN OKTAR: The first thing we should do in order to maintain our cultural roots is to put an end to Darwinist education. Darwinist and materialist educations are the most perilous issues to deal with since Darwinist philosophy denies God, the Prophets and Divine revelation. In other words, Darwinism is a system that denies all of our sacred values. The government teaches Darwinism by printing millions of books for primary, secondary and high schools as well as universities. Our President Erdogan should deal with this perilous issue. ADNAN OKTAR: Raising a technical person and raising a Muslim are separate things. When Muslims are raised, when youth are raised as men of cause, believers would act in unity in times of incidents, but if you raise technical people, they would not care about you, they would simply deal with their own businesses; they tend to fulfill the necessities of their own profession. They would not put themselves at risk for you, nor put themselves in a difficult position, nor would let anyone say anything against them. They lean towards wherever they see their own interest; what I am saying is the case for some of them; the others, of course, might act differently but the majority of them tend to act this way. I mean if a world of personal interests is formed, people would only tend towards those interests, but if a world in compliance with the good pleasure of God is desired, then a youth with profound faith should be raised based on the facts leading to faith, with the miracles of the Qur'an. ADNAN OKTAR: Let us end the Darwinist and materialist education and depend upon science instead. We should reveal the facts of science. It is crystal clear what science reveals. For instance, we should display fossils for the youth to see. There are hundreds of thousands of fossils in Turkey. They should have a look at those fossils and see that life forms have not changed since they were created; and have been the same from the beginning. The government should explain the structure of proteins to the youth through the Ministry of Education. They should explain that proteins cannot come into being coincidentally. And then, we will be free from this scourge of Darwinism. ]]>http://sheikhnazimalhaqqani.com/en/What-he-said-What-happened/219443/turkish-president-erdogan-“turkey-hashttp://sheikhnazimalhaqqani.com/en/What-he-said-What-happened/219443/turkish-president-erdogan-“turkey-hasSun, 10 Apr 2016 11:45:00 +0300"Those Who Commit Violence Against Health Care Personnel Will Be Arrested "
"We are taking measures for violence against health care personnel. Those who commit violence against health care personnel will be taken into custody. This matter will be treated with utmost attention. Our police will be responsible for the safety of health care facilities and coordination of private security personnel. Those who threaten or insult the health care personnel will be arrested. We will ensure peaceful and safe working conditions for our doctors and health care personnel." In one of his conversations, Mr. Adnan Oktar said that doctors should be held in high regard everywhere, and stated that the penal sanction for aggression against doctors should be more severe. 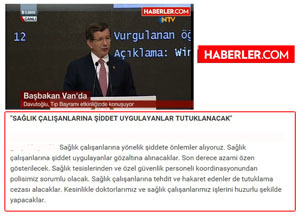 Likewise, in a speech, Our Prime Minister, Mr. Davutoglu stated that those who commit violence against health care personnel will be arrested. ADNAN OKTAR: There is an ongoing trend among patient relatives of attacking [health care personnel], breaking the doors and windows of emergency units. They think it is a heroic act. These people are on their foot all day long, trying to do their jobs among patients covered in blood, among screaming, wailing people. They have a very difficult job. People should show some sympathy. Better working conditions can be provided for doctors and health care personnel. They should be held in high regard everywhere. The penal sanctions for aggression against doctors should be more severe. "Mr. Davutoglu should go to Qandil and burn it down and level it to the ground if necessary. Strike Northern Syria like lightning if necessary. Show everyone the power of Turkey without listening to the USA, which says “Stop shooting the YPG” and considers the PYD as an ally, and without regarding Russia’s provocations. Clean all those areas where the PKK/PYD exist and cause a fit. Save this precious nation from the scourge of terrorism." In his daily conversations, Mr. Adnan Oktar frequently states that the PKK tries to form a communist state on the Southeastern border of Turkey. Therefore, it is necessary to react strongly so that the hazards can be completely removed. 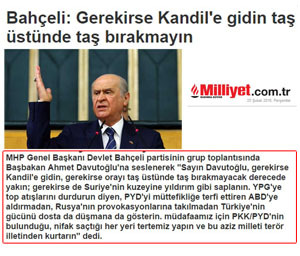 Devlet Bahceli, Chairman of the Nationalist Movement Party (MHP), also indicated in a speech that the government should do what is necessary and “level everything to the ground” if necessary just as Mr. Oktar states. ADNAN OKTAR: ... You will first tell them to evacuate the region. You will give them 24 hours or 48 hours. THEN, YOU WILL LEVEL THOSE LANDS TO THE GROUND. You will turn it into hell and show your determination. ADNAN OKTAR: They say: “We will form a communist state modeling North Korea. We will cause trouble in the entire region.” THE TURKISH ARMY SHOULD RESPOND NOW, THE TURKISH POLICE SHOULD REACT in the language that they would understand since they are not capable of understanding. A verse in the Qur’an also refers to this: “they encountered a community that understood nothing. Then the mountains became level,” that is, flat. Our army should do what the Qur’an refers to. THEY SHOULD LEVEL DOWN THOSE MOUNTAINS and warn the people a month before. ADNAN OKTAR: THE PKK SHOULD BE WIPED OUT FROM THAT MOUNTAINOUS TERRAIN IN QANDIL. It is told in a verse “Two mountains become equal”. What will you do? You will turn it into lowland. Those mountains should be leveled down one by one. It would take fifteen minutes. However, it is of course necessary to evacuate the land. There has been an intense military activity in the Yuksekova district of Hakkari. Having departed from Van, about 80 tanks entered the town center under extensive security measures. From there, the tanks went to the Division Command that is located on the Silk Road. In his conversations, Mr. Adnan Oktar frequently mentions the necessity of increasing the number of tanks in the South East and East regions of Turkey as a deterrent force. Likewise, 80 tanks have been recently dispatched to the Division Command located in the Yuksekova district of Hakkari. ADNAN OKTAR: …The terrorists should be surrounded by tanks on all fronts. The tanks are ready and waiting, we should utilize them. If I am not wrong, Turkey has approximately five thousand tanks, we should use them. ADNAN OKTAR: Turkey should wipe PKK out completely. The army should lay siege to the region with two thousand tanks. The operation can be completed in 48 hours, the terrorists having been wiped out or captured as a result. The government can break the Stalinist siege there. ADNAN OKTAR: The number of tanks in Turkey’s possession should be increased. We need at least 20,000 - 30,000 tanks, at the very least because tanks are required everywhere. Using tanks, you can enter an area and ensure its safety with ease.